Breakfast bruschetta. When I came up with the idea, it felt like such a revelation. Bruschetta in the morning? Great idea. 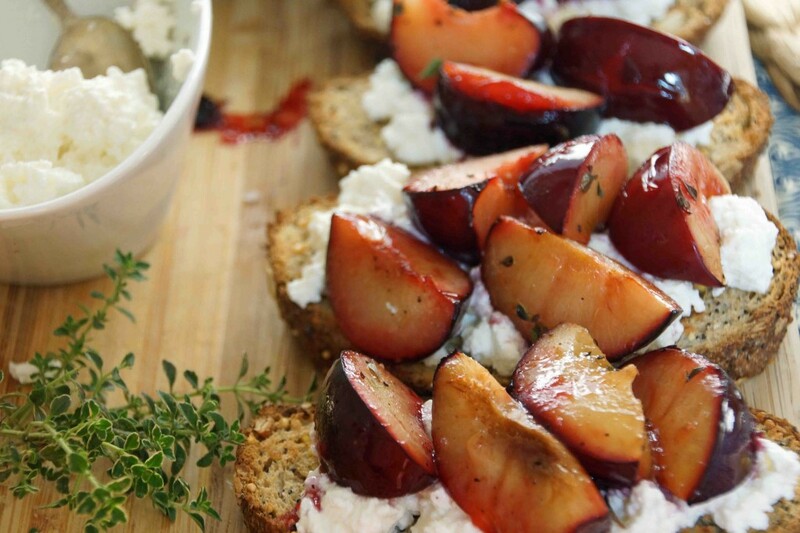 Honey-roasted plums and fresh ricotta cheese on crisp, nutty bread? Brilliant! And then, a little later, I smacked myself on the head. Breakfast bruschetta isn’t anything new, it’s just stuff on toast. Toast. As in breakfast 101. As in we’ve all been there, done that, a million and a half times. 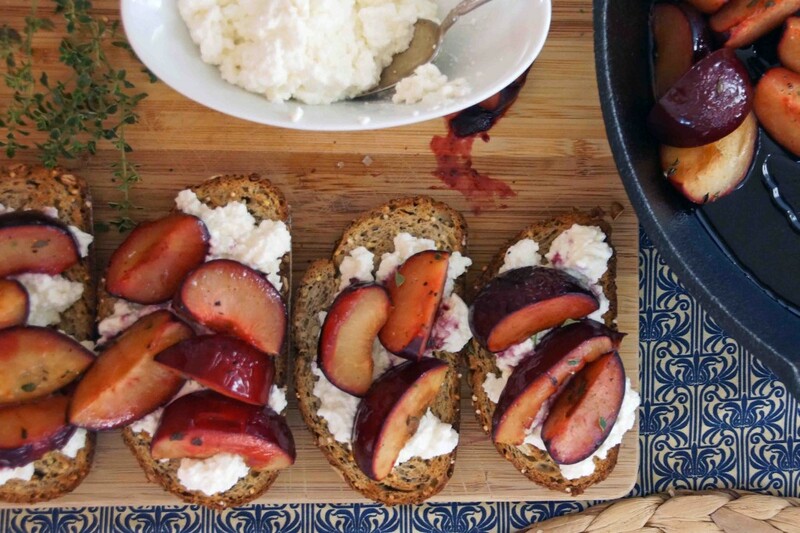 Well, ground-breaking or not, this plum and ricotta bruschetta is definitely worth making. 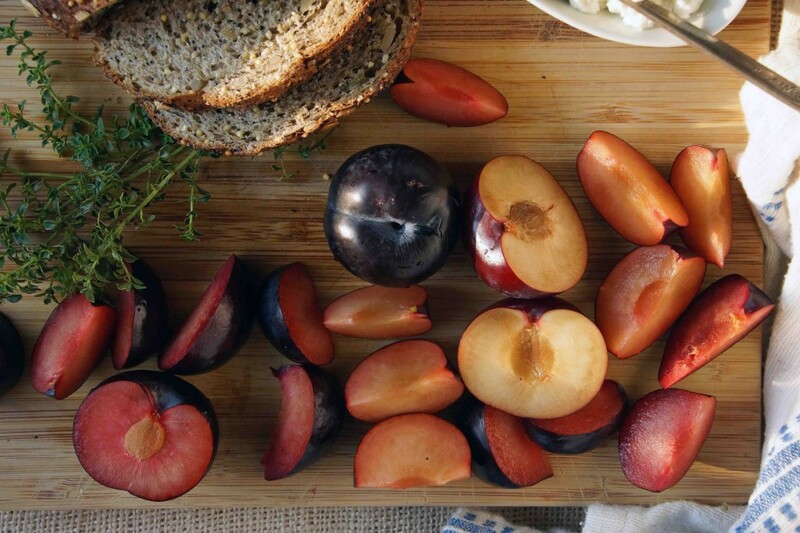 The roasted plums themselves are pretty special, sweetened slightly with honey, savoried (yes? Yes.) with a pinch of sea salt, a twist of pepper, and a sprinkling of thyme leaves. The base is seedy whole grain bread, toasted ’til it’s crunchy around the edges. And, when you use fluffy fresh ricotta to bring the two together, you’ll officially enter breakfast heaven. Time to change the world, err…what we put on our morning toast. Grab a loaf of hearty bread. Nuts and seeds are your friends; they taste great and your breakfast will stick with you much longer. Gather up a bunch of plums. I suggest at least 2 more than you think necessary. 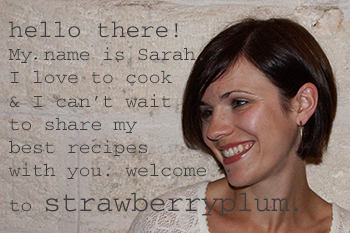 You’ll thank me when you’re sneaking the leftover plums, cold from the fridge, at midnight. Fresh ricotta. I hear it’s easy to make, but I just buy mine from the cheese counter at the grocery store. Avoid the mass produced stuff next to the sour cream–it’s too dense; we want to start our day with fluffy clouds, not clunky globs. Pick few sprigs of thyme and we’re ready to go. Ideally, I’d use the small Italian “prune” plums, but sometimes they’re hard to track down. Regular, smallish, plums will work just as well; we’ll just cut them in wedges rather than halves. 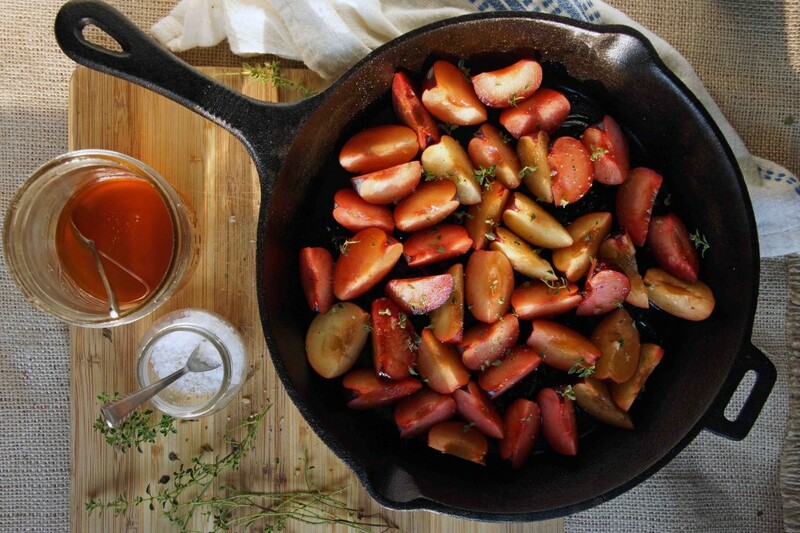 Toss the plums into a baking dish or skillet and drizzle with honey and olive oil, sprinkle with thyme leaves, sea salt, and a few twists of black pepper. Pop them into the oven to roast. Cut thick slices of bread, place on a baking sheet, and bake until they reach your desired level of toasty. I like my crostini assaultingly crunchy, Matt likes his still soft in the middle, so we compromise on crispy edges and golden, but not tooth-breakingly crunchy, center. Pull the plums out of the oven when they’re warm and juicy, but still holding their shape. Assemble the bruschetta. 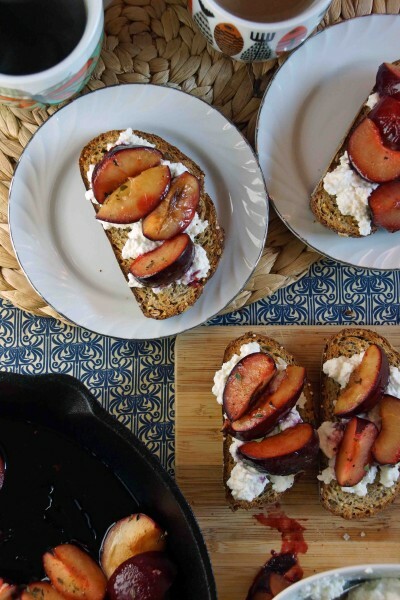 Spread the bread with ricotta, add roasted plums, and spoon the yummy pan juices over the top. Pour yourself a cup of coffee and pat yourself on the back. 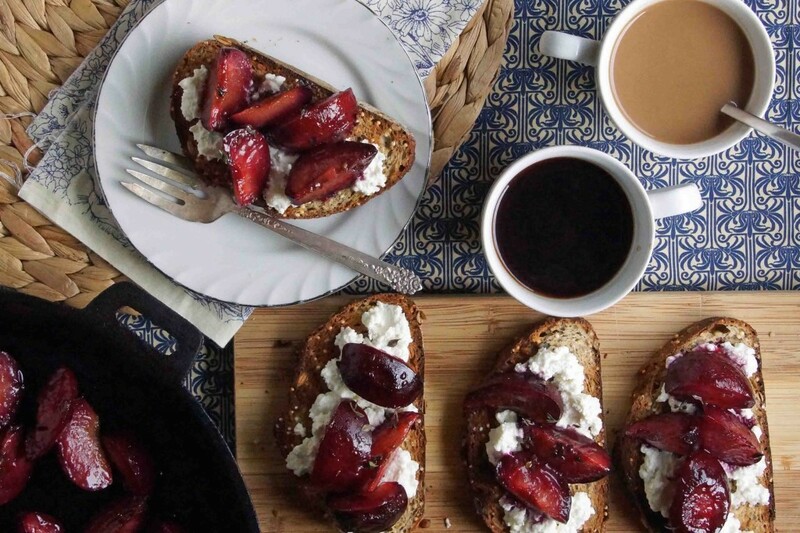 Are you changing the world with your breakfast bruschetta brilliance? No. But you’re making a dang good piece of toast. I ate my plum bruschetta on its own for a nicer than usual weekday breakfast. If you'd like to elevate yours to weekend brunch status, serve a green salad on the side and pass a plate of prosciutto. Cut the plums into wedges. Mine were pretty small; I cut each one in sixths. If you are using the really small Italian plums (which is my preference, but not always the easiest to find), just halve them. Place the plums into a baking dish or oven-proof skillet along with the olive oil, honey, thyme leaves, salt, and a few twists of pepper. Toss to coat. Roast until the plums are soft and juicy, but still holding their shape, about 15 minutes. Meanwhile, cut the bread into 8¼-1/2 in. thick slices. Place on a baking sheet and drizzle with a tiny bit of olive oil. Bake until toasty, 8-10, flipping halfway through. Spread each piece of toasted bread with ricotta. Top with a few roasted plums and spoon pan juices over the top. Serve immediately. 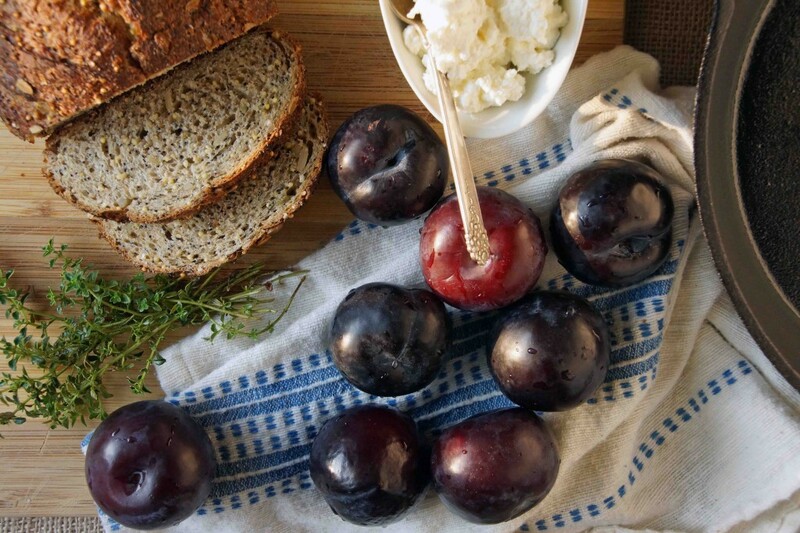 If you have leftover roasted plums, they're great over plain yogurt or vanilla ice cream. The leftover plums will turn purple if they sit in their cooking liquid overlay (as evidenced in my photos!). Brilliant is right…I love a whole meal on toast! This would be great for breakfast or for lunch…and what a great way to use all the plums that are everywhere right now. No wonder you had ricotta on the brain today! (I said “REGATTA, not RICOTTA”!) Looks wonderful! Indeed! But, really, when don’t I have cheese on the brain? I tried this, I put the prosciutto on top of the ricotta. Now that’s a complete breakfast.